A little good news on the climate change front, for a change: some marine organisms may be able to adapt surprisingly well to ocean acidification caused by carbon dioxide from burning fossil fuels. 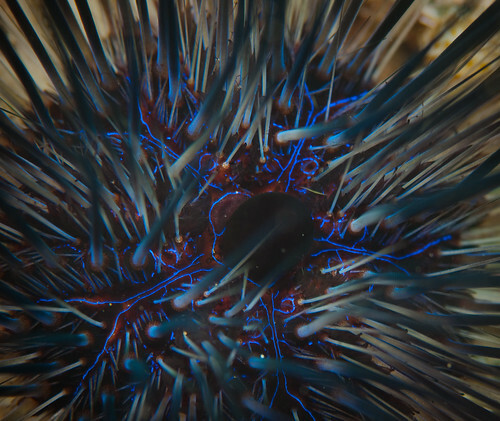 "If there's any organism we would expect to be able to adapt to something like this, it would be the purple sea urchin, because they have evolved in such a variable environment," says Pespeni. The urchins live on the Pacific coast of North America, where they often experience upwellings of CO2-rich water from the deep ocean. Earlier studies had shown that the urchins had unusually high levels of genetic variability. Pespeni's new study shows that evolution can rapidly select the gene variants needed to adapt to more acid conditions, says Jennifer Sunday, a climate change ecologist at Simon Fraser University in Burnaby, Canada. Last year, researchers in Germany reported similar adaptation to acid conditions in a single-celled alga. It remains to be seen, however, whether other species can evolve quickly enough to cope with ocean acidification. Most likely some will and others will not, says Sunday, "so we're looking at a future ocean that could be quite different".